In late August 2012, Archbishop Desmond Tutu was slated to attend and speak at the Discovery Invest Leadership Summit in Johannesburg, South Africa. He canceled at the last minute. Tony Blair was one of the honored invitees and Tutu, quite simply, couldn't stomach the thought of sitting alongside a war criminal, especially such a craven, unapologetic and unaccountable one. Writing in the Guardian about his decision to deliberately spurn Blair, Tutu explained, "The immorality of the United States and Great Britain's decision to invade Iraq in 2003, premised on the lie that Iraq possessed weapons of mass destruction, has destabilised and polarised the world to a greater extent than any other conflict in history." 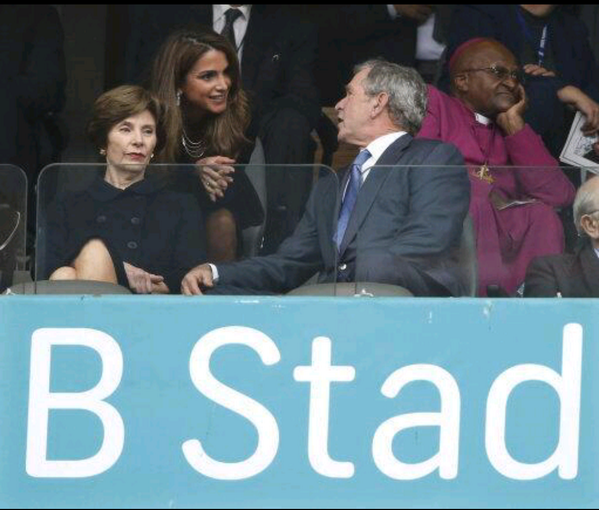 George W. Bush and Tony Blair "fabricated the grounds to behave like playground bullies," Tutu continued. How can it be that "Tony Blair should join the international speakers' circuit," while other treacherous and blood-thirsty figures are overthrown, assassinated and prosecuted? 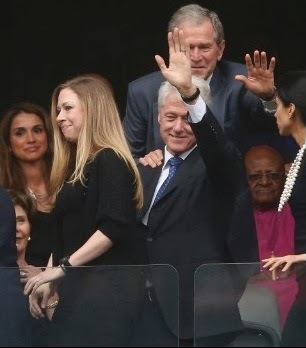 In a just world, Tutu noted, Bush and Blair would be sent sniveling to The Hague, condemned in the International Criminal Court and imprisoned for their crimes against humanity. "Leadership and morality are indivisible," Tutu wrote. "Good leaders are the custodians of morality... If it is acceptable for leaders to take drastic action on the basis of a lie, without an acknowledgement or an apology when they are found out, what should we teach our children?" Tutu's longtime friend and ally, the now departed Nelson Mandela, surely would have concurred. Shortly before the invasion of Iraq, Mandela slammed Bush for acting on behalf of the "arms and oil industries," and derided him for being a leader with "no foresight, who cannot think properly" and is "wanting to plunge the world into a holocaust" and "trying to bring about carnage." Mandela expressed no love for Blair either. "He is the foreign minister of the United States. He is no longer prime minister of Britain," Mandela said. 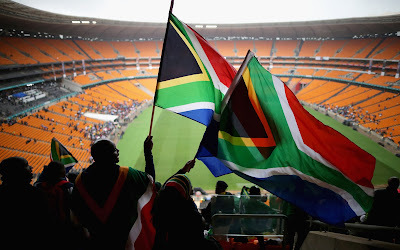 With this as prologue, both the invite list and seating assignments for today's memorial service, held in FNB Stadium in Johannesburg's Soweto township, were truly disturbing. The private seating section shared by South African dignitaries, numerous world leaders and assorted war criminals not only exposed the lack of understanding of Mandela's life and legacy, but also a profound dearth of respect for Desmond Tutu. As these photos demonstrate, the Archbishop still isn't a fan of rubbing elbows with liars and murderers, who - rather than being closely watched while on furlough from lifetime incarceration - are inexplicably allowed to roam free. Unfortunately, things didn't pick up for the Nobel Peace Prize-winning Archbishop as the day dragged on. Sorry Desmond, you deserve better. So does Mandela. So do we all.